It might not seem like a big thing, lugging your ice skates from home to the rink and back again. But, regardless of whether you’re a professional or someone who just likes to take a few turns on the ice, finding the right bag for your skates is just as important as finding the right skates themselves! 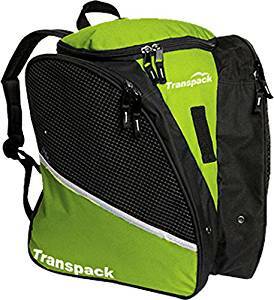 For those that are looking for a whole lot of function from their ice skate bag, as well as a nice form, the Transpack Ice with Print Design is a great choice. The interior is very room; you won’t just be limiting the cargo to just your ice skates, for sure! It can hold most of the other gear that an ice skater could possibly need. In fact, it can even fit small helmets, something not many bags can boast. This is all due to its patented isosceles shape, making it extremely roomy. Want durability? This is it! It’s a sturdy bag, made of a coated 600 denier polyester, to take almost anything that you can throw at it. And you can’t forget comfort and convenience: The shoulder straps mean that it can be used as a backpack, too, making transport a cinch. Made out of a durable 600 denier polyester. Has an interior pouch, for other gear. Contains drainage grommets, to stop the pooling of water. Very roomy, so that you can carry all of your equipment in one place. Easy to carry, can be worn in the same fashion as a normal backpack. The straps are a bit small, making it better suited for a teenager or someone with a light frame. This bag can be a bit heavy on children, especially when it’s fully loaded with gear. The Transpack Ice with Print Design is a good choice for an average price. While it might not be easy to wear for bulkier frames, and might be a bit too heavy for children when packed down, this is a bag that should work for the average person that wants to carry all of their equipment at once. Sometimes, you just need something that can cover the basics, and look good while it does it. That’s where the Epic Skates Limited Edition Smile Skate Bag comes into play. 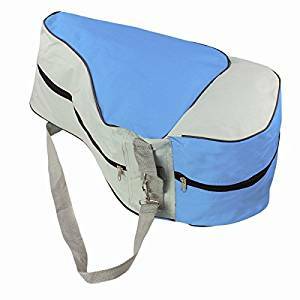 This is a great basic bag that isn’t too expensive, making it a big plus for the beginner of for those who only ice skate as a hobby, not as a career or as a serious sport. 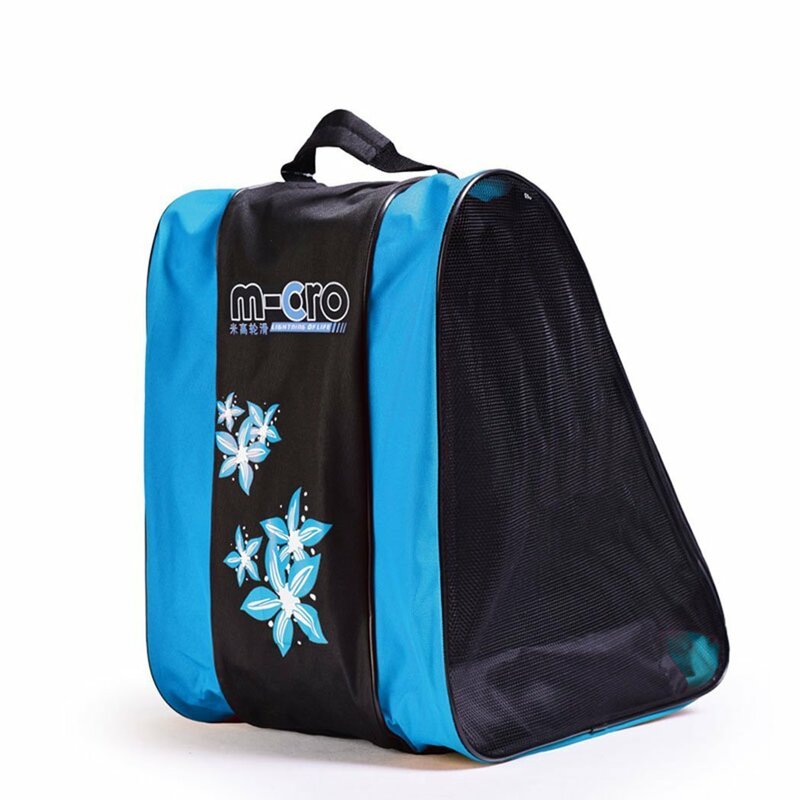 The most notable feature of this ice skate bag is the cut design that it comes in, making it a great choice for both kids and kids at heart! It’s large enough to hold most types of ice skate, and has an ID pouch, as well as a zippered pocket for things you might need to carry. Do you switch between ice skating, rollerblading, and skating on traditional roller skates? This bag can carry all of them! The design is adorable, in a fun shade of pink with a “smile” print that most girls will adore. Can hold not only ice skates, but rollerblades and roller skates, as well. Has an ID slot and a zippered pocket. There is no real way to use this bag to transport all of your gear at once. This bag doesn’t really fit for a professional or serious skater; it’s a better fit for those who skate casually. The material isn’t as sturdy as some other skate bags. 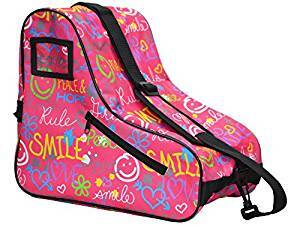 All things total, the Epic Skates Limited Edition Smile Skate Bag is a good choice for the hobbyist ice skater, or for someone who goes between using ice skates, rollerblades, and roller skates. The design is fun, but more suitable for a younger (or young at heart) person. And, while it can carry any kind of skates, it can’t carry much else. Still, it’s a good bag. Sometimes, you just need a bag that can do it all. And, for most, you’ll find that the SHENGXIA Unisex Waterproof Nylon Triangle Bag is that bag! This is truly bag that can do anything that you need it to. Made out of a rugged waterproof nylon, it’s great for both hobby skaters and those who skate on a more regular basis. Switch from ice skates to roller skates? What about in-line skates or rollerblades? No matter what, this is a bag that can handle it. Not to mention your gear: Because of the triangle shape that it possesses, there’s plenty of room for more than just your skates in the three large pockets it boasts. Comfort and ease of carrying isn’t something that you have to worry about, either: It can be carried either with a single handle, or it can be worn as a backpack. And the price? Very low! Can be used for any type of skate, whether it’s ice skates or traditional roller skates. Can be used to carry equipment beyond just your pair of skates. Can be carried either one-handed, or can be worn as a backpack. The price is low, one of the best you’ll find for a bag of this quality. It’s unisex, and perfect of all ages, from children up to adults. Though waterproof, that also means that it could possibly trap water inside the bag itself, a common problem for waterproof bags. This is a bag that almost anyone can use, and will most likely enjoy using. It can do a bit of everything, and is very adaptive to your own styles and needs. It’s unisex, as well as a good choice for all ages. The price being so low is just the icing on the cake here. There are times when your top priority in an ice skate bag just has to be durability. In those cases, a lot of people will be happy with the Zuca Sports Midnight. This ice skate bag is made out of strong, durably material, and has a very dependable structure that make it a good choice for those who put their bags through some wear and tear. It’s also great because of its function: Not only is it large enough to hold your skates, plus other equipment, it also comes with two external sections. This is a good quality for those who have items that they’d rather not stash with their wet ice skates after a busy day on the rink. One downside, however, is that this is the insert for the bag only. In order for it to work properly, you need to buy a frame, which isn’t included. This bag is highly durable, making it a good choice for cases where it will be used roughly. Large enough to hold your ice skates, roller skates, rollerblades, or any other type of equipment. Has two external pouches, for conveniently carrying other items. This is only part of a system. In order for this bag to work properly, you’ll also need the frame that is made by the same company. Considering that you also have to buy the frame, the price isn’t exactly on the low side. Be prepared to pay even more later on. If you’re looking for something very durable, and don’t mind the extra cost that comes with purchasing more equipment, then the Zuca Sports Midnight might be a good choice for you. It’s strong and sturdy, as well as very convenient to use. But the additional expense might be too much for some. 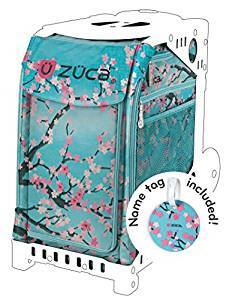 For the more fashionable-minded ice skaters who also want a bag that can take a lot of wear and tear, the Zuca Hanami Sport Bag is a choice that bears careful consideration. Though it’s only an insert, requiring a separate frame to be purchased in order to function properly, this is a bag that can take almost anything and look good doing it. The ruggedness of this bag can’t be dismissed, either. Made of premier 600 denier polyester, it’s durable enough to take almost anything that you can throw at it. Get it dirty? Not a problem! This ice skate bag is hand washable for easy cleaning. It’s large enough to accommodate not only your ice skates, but some equipment as well, and comes with external pockets for separate storage. Worried about losing your bag? Don’t be! It has a matching name tag. Made out of durable, premier 600 denier polyester. Has a beautiful, delicate cherry blossom design on a blue background. Large enough to handle not your only skates, but also equipment. Separate outer pockets for storage. Great for ice skates, roller blades, roller skates, and in-line skates. Hand-washable, for easy cleanup in case of a mess. Comes with a matching name tag, so there is no worries about lost bags. Rugged enough for extended use. In order for this bag to work properly, you’re going to have to purchase a separate frame. The Zuca Hanami Sport Bag is a very beautiful bag, and it does have a lot of good features. Being hand-washable and full of storage space makes it convenient, while the 600 denier polyester makes it rugged and strong. However, the needed purchase of a frame in order to use this bag means that it might be too burdensome to buy. Are you looking for a bag that is everything that you need, all in one? 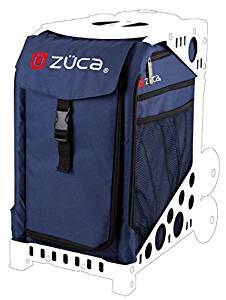 If you’re not too concerned about the price, then the Zuca “Calypso” Sport Insert Bag with Sport Frame is a good choice in ice skate bag. As the name suggests, the Calypso is an insert type of bag. However, while others don’t come with the needed frame, leaving the bag itself useless until they do, this one comes with a frame in the color of your choosing! Though you do pay extra for it, it ups the convenience. Not that convenience is the only reason to consider this bag. It’s large enough to hold your skates and equipment, and is durable enough to be used for an extended amount of time, even in harsh conditions. It can hold up to 300 pounds of weight, and is made out of 600 denier polyester. Comes with both the frame and the insert bag, for added convenience. The telescoping handle means easier carrying. The frame can support up to 300 pounds of added weight. Made of 600 denier polyester for a rugged exterior. Comes with an extra large utility pouch, to carry even more of your gear. Dual wheel system makes climbing slopes and stairs easier than ever. Comes with a built in seat, excellent for taking off your skates. The cost is definitely on the higher side, being, on average, between $148 and $228. As far as ice skate bags go, the Zuca “Calypso” Sport Insert Bag with Sport Frame is definitely a worthy contender. It offers everything that you could possibly want in an ice skate bag. This includes a seat to take your skates off! The only downside is the hefty price tag. As far as getting the best deal budget-wise, the Eforstore Ice Skating Bag is probably the best buy on this entire list. Without a doubt, its price is the top reason why you should consider buying it: At an average of just $13 on Amazon, this is a bag that you can buy on even the tightest budget. But, you will get what you paid for. It is a fairly standard ice skate bag, and can hold roller skates, rollerblades, and in-line skates, as well. It comes with a shoulder strap, and is roomy enough to make storing your equipment simple. The material is thin, meaning that it isn’t as durable as some of the more expensive models. And, if you’re only storing small skates, this bag might be took big to carry them easily or comfortably. At the average Amazon price of $13, you won’t find a cheaper ice skate bag on this list. Roomy enough to hold all of your ice skating equipment. Can be used for ice skates, rollerblades, roller skate, and in-line skates. Has a convenient shoulder strap for easy carrying. 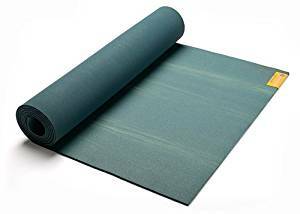 The material is weak and flimsy, making it not a good choice for heavy usage. Not a good choice for carrying small skates or for carrying anything that is too delicate. Not a lot of support for your gear while it’s in the bag. Overall, if you’re a beginning ice skater, or if you don’t go out onto the ice much, the Eforstore Ice Skating Bag is likely a good choice for you. It isn’t heavy duty enough to take on extended use, but it’s cheap enough that it won’t hurt the hobbyist’s budget. Are you looking for the top class in ice skate bags? Trying to find the best of the best, and willing to spare no expense? 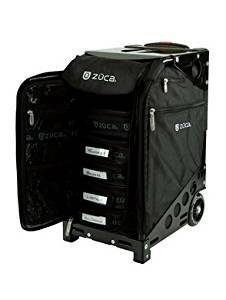 Well, then look no further than the ZUCA Pro Artist Wheeled Suitcase! This bag has anything and everything that you could want. Made of 1680 denier ballistic nylon, it’s extremely sturdy, for rough or continued use. It has a long, 41 inch telescoping handle, for easy transportation. The wheels make moving it from place to place easy, too. Worried about its capabilities to actually hold your ice skating supplies? Don’t be! This bag has a rather unique shelving system, to hold everything where it should and keep your things organized. It can even give you a spot to sit to put on or take off your skates: It has a built-in seat that can hold up to 300 pounds! Made of 1680 denier ballistic nylon, for a sturdy outer layer. Has a telescoping handle that reaches up to 41 inches. Innovative shelving system to better hold your items. Wheels, to make transportation easier. Comes with a seat that can safely hold up to 300 pounds. Feet are perfect for scratchable surfaces. The insert bag is hand-washable, for quick, easy, and simple cleanup. This system is all-in-one; you don’t need to purchase a frame. The only real downside is the price. The average you’ll pay on Amazon is approximately $305 for the entire set. 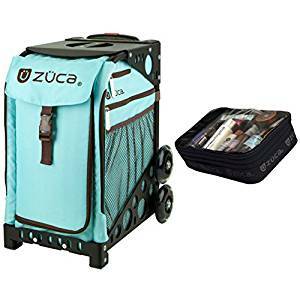 If money isn’t an issue and you’re going to be using your ice skating bag a lot, then the ZUCA Pro Artist Wheeled Suitcase is likely the best choice that you can make. It has everything someone would need from an ice skate bag, and has practically no flaws beyond its price tag. Even though the name doesn’t explicitly state it, the High Bounce Rollerblades Bag is actually perfectly suited to carry your ice skates, as well as the rollerblades mentioned in the name. It’s also a good choice for roller skates and in-line skates, as well. This is a great bag for someone who wants something that can not only hold everything that they need, but something that can easily be folded and put away when it isn’t in use. The High Bounce Rollerblades Bag is lightweight, making it easy to use and easy to store. It’s also got a lot more storage space than it looks to. In fact, there is even a zippered mesh compartment inside that would be perfect to hold a helmet, one of the hardest things to stow away in a bag. And it’s cheap, with the average Amazon price being just $20. Can be used to hold ice skates, rollerblades, roller skates, and in-line skates. Has a zipper mesh compartment that can be used to store a helmet. Comes with plenty of storage. Lightweight enough to easily use. Sturdy enough for normal, everyday use. Can easily be folded away when it isn’t currently in use. Comfortable to carry with you. At an average Amazon price of just $20, this bag is very cheap, especially for its quality. The material is a bit flimsy, and likely wouldn’t be appropriate for more rugged uses. 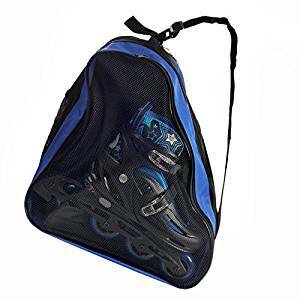 The High Bounce Rollerblades Bag is a great choice for anyone who is looking for a quality ice skate bag for a very low price. It has ample storage space, and is lightweight and easy to use. The fact that it can be used for any kind of skate is only a bonus. Sometimes, something just has to look nice and work well, and there’s nothing else to it. That’s where the ZUCA Bag Pink Hot Insert & Frame comes in! The first thing that you’re likely to notice about this bag is the hot pink color (hence its name). That’s something that will really make this ice skate bag stand out from the crowd! But it’s more than just style; it’s function, too. This bag is sturdy, made out materials strong enough to take even the roughest wear and tear that you can put it through. The only downside might be the price tag: It clocks in on Amazon at roughly $163. However, this includes both the insert bag and the frame. Comes with a telescoping handle, for easy transport. The wheels light up, to provide more visibility to the ice skate bag. Comes in a very fashionable pink color. Wheels are designed to be able to go over stairs and other oddly shaped surfaces with ease. Has a jeweled closure and other jeweled details. Comes with both the insert bag as well as the frame. Comes in your choice of frame color. At an approximate price of $163 on Amazon, this is one of the more expensive ice skate bags that you can buy. 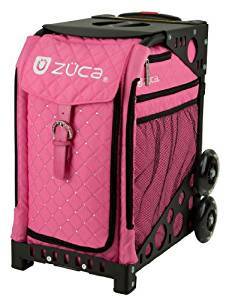 It’s obvious that, with the ZUCA Bag Pink Hot Insert & Frame, fashion comes foremost. However, that isn’t all that this bag has to offer. If you can afford the price tag, you can get one of the best ice skate bags on the market. It’s form, function, and fashion all in one! Finding the right ice skate bag isn’t always easy. You have to look at form, function, finance and, yes, at times, even fashion. With this list, hopefully you’ll be able to find the right bag for your skates!